Hopefully your semesters are off to a rousing start. I hoped that we could communicate a bit more extensively about our respective programs. One of the great things about the CFH is that we have this (inter)national breadth of scholars in various places, points in their careers, and experience levels. We all wrestle with similar problems and frustrations, yet we seemingly all put up with (or do I mean endure?) them for the same reasons. It’s my idea that in the comment section of this post, some of you might be willing to share an extended “status update” of sorts with colleagues. Who knows, maybe there’s a fellow CFH member at a nearby school… or sitting at the other table in your coffee shop. Won’t you join us? I suppose I’ll get us started. After the awesome CFH Conference at Gordon College in the fall and the birth of my baby girl, life’s been a bit of a roller coaster. I’ll decline to comment publicly on the exact status of my dissertation, but suffice it to say I’m near(ing) in the end. That said I’m adjuncting (and, apparently, gerunding) at two different schools in two different states. I’m thankful for both opportunities. I am particularly excited about a course I’m teaching at Geneva College called Digital History in which I’m working with 7 undergraduates to build an archive. We’re still narrowing our focus and determining what it will look like exactly, but I hope to have something to share with you all. In terms of “what I’m reading” these days… that’s an oddly personal question but one I like thinking about. I’ve been trying to read more on postmodern education, as I see it as an important obstacle to effective teaching compared to the late-modern era of schooling that bore my scholastic self. I’m working on N.T. Wright’s *How God Became King* for a dose of the theological. For my academic historical reading, I’m trying to broaden some theoretical work on correspondence in the 19th century as well as failing horribly in my attempt to keep up with the unending waterfall of Civil War historiography. The best book I’ve read recently is Mark Schantz’s *Awaiting the Heavenly Country* about death culture that motivated the society of Americans that fought and supported the Civil War. 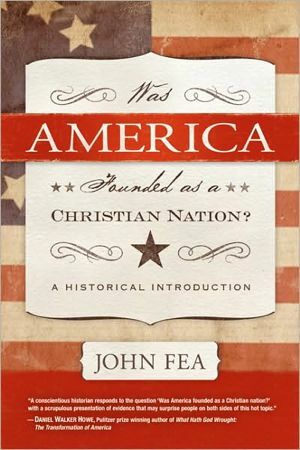 The Conference on Faith and History’s own John Fea (Messiah College) recently released a book on the founding of the United States. If anyone is interested in writing a commentary on the book for this blog, please let me know at grjones83@gmail.com. To follow Professor Fea and his comments about this book, links, and cultural commentaries, visit his blog. I would call few of the books assigned for class “page-turners.” Alfred Chandler, you are a good man, but The Visible Hand didn’t quite take hold of me. And one of the words I would not use to describe The Fall of the House of Labor is riveting. However, each monograph has a rightful place in the graduate seminar. Understanding the transformation of the American economy in the mid-nineteenth century or the demise of a united labor front at the turn of the twentieth century are essential to piecing together a larger narrative of American history. Every once and a while I am assigned a book that makes my usual approach to reading difficult. I typically use the following steps as a guide: 1. Read reviews. 2. Carefully examine the Table of Contents. 3. Read the prologue and the epilogue. 4. Skim chapters. I don’t like this process, but I’ve found it to be a necessary evil. I would love to sit down and read every single book (well, I take that back…most books) from front to cover, but that just isn’t realistic. For example, the second week of courses I was assigned three books, each more than 500 pages in length. I also had to write two essays and prepare two lectures. Now, some might be capable of such a feat. Me, not so much. I suppose if I had forgone sleeping and showering, church, and my requisite yoga classes (believe me, no yoga makes for an incorrigible Cali), then I might have been able to give a thorough reading to all 1500 pages. This was yet another week full of an intimidating amount of reading. I still haven’t touched The Promise of a New South by Edward Ayers or the book assigned for Global Enivronmental History. But I just cannot put down White Mother to a Dark Race by Margaret Jacobs. Jacobs writes a comparative analysis of settler colonialism and indigenous child removal in the American West and in Australia. She reveals striking similarities between the two nations, particularly in a time when both the U.S. and Australia were bent on securing a more powerful place on the world stage. In her exploration of the American West, Jacbos shows how Indian removal allowed white women to leverage power, yet despite their heavy hands in the removal, rearing, and education of indigenous children, white women were ultimately subject to the male-dominated authority of the state—a state with an acute goal: to acquire land for the sake of nation-building. White women in both the U.S. and Australia used a variety of means to justify transferring children from the care of their tribes to boarding schools, dormitories, and white homes, but most of their rationale fell under the umbrella of Christian charity. I found one excuse especially troubling. Women missionaries involved in removal zealously advocated for a sexual division of labor based on middle-class, Christian, white gender norms. According to Jacobs, these women believed that “‘true women’ oversaw domestic duties and guided affective relationships in the home while their husbands worked outside the home for pay.” Indigenous sexual division of labor did not conform to this standard and thus white women actively upended the long-established traditions of both Indian and Aboriginal families. She seeks wool and flax, and works with willing hands. She is like the ships of the merchant; she brings her food from afar. She rises while it is yet night and provides food for her household and portions for her maidens. She considers a field and buys it; with the fruit of her hands she plants a vineyard. She dresses herself with strength and makes her arms strong. She perceives that her merchandise is profitable. Her lamp does not go out at night. She puts her hands to the distaff, and her hands hold the spindle. Although some of the above tasks were considered domestic and appropriate for women by nineteenth century standards, others were condemned or considered men’s work. How could missionary women, committed fully to spreading the gospel and Christianizing indigenous women (and men), have interpreted the physical labor of indigenous women as backward or oppressive when clearly, the godly woman from Proverbs engaged in similar tasks? This made me think about how our interpretation of Scripture is at times subject to the larger cultural and social patterns of the world in which we live (similar perhaps to how the women, despite their own maternal instincts and efforts, were subject to the demands of the state). This both humbles and frightens me. In what activities do I engage in the spirit of Christian compassion or concern that in one hundred years will be understood as oppressive, judgmental, or misdirected? I can only hope that I am not completely blinded by my situatedness. I can also strive to be self-reflective enough to recognize my own prejudice and bias, and that I might leave a legacy not of unrestrained criticism, but of patience and perceptivity. After featuring the recent *Confessing History* on this blog, former CFH President Rick Kennedy (Point Loma) advised that we also feature an earlier, yet similar confessional history book. Graduate student scholars of the CFH, particularly those concerned with the issues of integrating faith and vocation, can benefit greatly from both of these books. My courses require an amount of work equal to the first semester, but they feel different, more purposeful. Two of three courses are in my presumed “field”: Environmental/American West. Each week in “Readings in the American West” our professor assigns two books. At the beginning of the semester he used a deck of cards to divide the readings evenly—each week half the group reads one, half the group reads the other; then we discuss each as a class. It’s like a two-for-one. This week I read Donald Worster’s Rivers of Empire: Water, Aridity, and the American West, while the other students read Dan Flores, The Natural West: Environmental History in the Great Plains and Rocky Mountains. This is my first taste of Worster, but I’m already smitten by his poetic prose and impassioned analysis of irrigation in the American West. And because that wasn’t enough water for the week (it is essential for life, you know), I read Water: The Epic Struggle for Wealth, Power, and Civilization by journalist Steven Solomon in my Global Environmental History course. Although each monograph is unique with different analytical frameworks, content, and calls to action, all three had something in common: a rather biting critique of the Judeo-Christian tradition. When it comes to the environment, Christians get a bad rap. Let’s face it, Genesis 1:26-28 has been interpreted in many ways, most often with a heavy emphasis on dominion. Worster briefly details the secularization of medieval Christian notions about nature (á la Horkheimer) into a Western worldview known for its exploitation of the environment. He’s not complimentary. But who can blame him? Or Flores, or Solomon. Of all the public interest issues evangelicals support (abstinence education, anti-abortion, politics and morality, etc.) concern for the environment lags behind, far behind. Solomon suggests that stewardship and dominion are a contradiction in terms, but he accuses Christians of using the terms interchangeably. Genesis 1:26-28 does make clear the command to rule and subdue the earth, but I must agree with Solomon. Using a biblical mandate to justify wastefulness and exploitation seems hypocritical, and it clearly goes against the rest of biblical teaching. In Genesis 2:15, one finds God’s further instruction to Adam and Eve—they are to keep the garden. The Hebrew word shamar means to keep, guard, keep watch and ward, protect, save life, as a shepard over his flock. It’s the same word used when God extols Abraham for keeping His commandments. Shamar is also used in Proverbs concerning wisdom: “Forsake her not, and she shall preserve thee.” Many Christians do take such commands seriously and also take personally the responsibility to be true stewards of creation. But, as is often the case, this portion is sorely underrepresented in the media and thus the Christian’s ambiguity in public life is perpetuated in the books of scholars such as Worster, Flores, and Solomon.I can’t offer a solution to our “public image,” one that is certainly grounded in historical reality. But I can ask you to consider what God asks of His people when it comes to his creation. When we fail to treat the whole of creation with honor and respect, we fail to fulfill part of our evangelical mission. We miss out on an important opportunity to show the world that a commitment to the earth is a commitment to the Kingdom come and that Christians do care about ecological issues. Readers of the CFH Grad Blog will be interested in the winners of all categories. Note that the winner of the History/Biography category is the CFH’s own Eric Miller (Geneva College). If you would be interested in writing a review or comment on this book, please contact me at grjones83@gmail.com.